Before offering thanks with reason, let me tell you a little bit about the struggles of 'The Big Move' and the effect on Baby B. When we decided we would take up a job offer and relocate from Cambridge to Wales, we immediately told Baby B that we would be going to live in a new house in a new place. He was involved in looking at show homes and we spoke to him about everything, every step of the way. He named the new place 'the big house'. As the moving day got closer, Baby B started to say occasionally that he didn't want to move, so I followed his lead. If he seemed anxious or upset, I would reassure him and not talk so much about the move, just busy him with other fun stuff. If he wanted to talk about it, we would speak about our huge new adventure, what would happen on moving day and all the fun things we would do when we got there. Then reality hit. After Hubby B being away for 5 days a week over two months, we moved mid October. We have had no internet since (it's a sad reality that we rely on it so much) and money has been a bit tight so we have not been able to go and do our regular outings like back in Cambridge and when I was working, like soft play centres and our regular trip to Costa! Baby B loves to go to cafes and his favourite is Costa because he can have a chocolate babyccino with marshmallows. Baby B has had to get used to a new house and a new environment whilst dealing with leaving his friends. His routine completely changed and we haven't been able to do our usual familiar activities that should have been able to make things a little better. Like watching episodes of favourite CBeebies programmes on the iPad for his TV time or listening to songs on YouTube (no internet) and going to Whale of a Time (soft play), baby groups, pre-school or Costa, post food shopping. This week Baby B has made a few comments about going home to 'the grey house' (the old house; no idea why he calls it that!) and missing his friends. I decided that we could spare £10 out of our Christmas budget (our average lunchtime spend in Costa) and go to 'the cafe' that Baby B was so desperate to go to. He told me he had been good and said "please Mummy can me, you and (littlest B) go to the cafe and have time." I often say to him that time together is important. He was so happy when we got there and told me we could put a happy face on his calendar back at home. This brings me to our experience in Costa, Caerphilly. When ordering his drink, Baby B asked the lady excitedly if he could have "a pink one and a white one" meaning marshmallows. The lady (whom I hope will not have marshmallows taken out of her wages) told Baby B that she had been speaking to Santa and he (Santa) had told her that Baby B had been a very good boy and he could have two pink ones and two white ones! Baby B couldn't believe his luck. As I sat drinking my coffee, Littlest B occupied with his drink and Baby B snuggled up for a cuddle, he told me he was a very lucky boy and the cafe lady was nice. My heart swelled with pride that he was so well mannered and appreciative but also I realised that Baby B was genuinely happy and comfortable in that moment. The familiar surroundings of the chain cafe, the friendly staff and the yummy marshmallows made his afternoon and the customer experience epitomises why I love a trip to a nice cafe. So even though this may be the norm for the Costa experience, yesterday Baby B's afternoon was made and he forgot about 'the grey house'. He wants to go back to his 'cafe' next week so we'd better start putting cafe allowances aside. 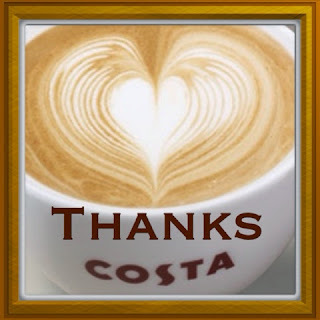 *This was not at all a sponsored post but a genuine thank you to Costa in Caerphilly. As what a lovely story :) chains aren't as bad as people think then!